If China doesn't agree to fair trade, what should Trump do? Discussion in 'Economics & Trade' started by KJohnson, Aug 5, 2018. Should Trump phase out dealing with China altogether and get those items elsewhere? Because Xi doesn't have election issues like Trump, and he really doesn't care if his people suffer thinking he'd rather that happen, than have his ego suffer, should Trump consider other options such as setting up trade with other countries for the items we are currently getting from China until we're able to fully phase them out? I mean if they refuse to deal properly and insist on stealing our intellectual property, what choice do we have? We can't let them keep doing that so I say we go around and stop trading with them entirely. Is that possible? America can make do without China, China will collapse without America. jay runner, Jarlaxle, KJohnson and 1 other person like this. when things always fall apart. Yes. FAIR TRADE is a scam to enrich Trump. KJohnson and webrockk like this. Its our fault we let it happen in the first place. Why would China ever give up their advantage? China can torture and abuse its people to levels we could never reach. The citizenry has no power unless they all rose up together. And they are kept in the dark anyhow. You have to be very privileged to really know whats going on. Thats the problem. We have to give a crap what the people think because we're a free society. China doesn't have to care. We're already playing with 1/2 a deck. Its the beauty of communism. It keeps working as long as money is coming in and you can keep giving people crumbs. Once its not, thats when the hangings begin. Thats why we have more leverage with EU trying to play the same game as China. EU gets upset when we apply similar tariffs as they've been applying for decades, but we're the greedy ones? Uuuum, no. Jarlaxle, KJohnson and Grokmaster like this. Or , maybe, change the law to sell them advanced guided missile tech to enrich himself, or have a Red Chinese spy as his "hangin' buddy" for TWENTY YEARS.....you know, the democrat "Chinese policies"...in addition to COMPLETLEY FAILING TO ADDRESS the TRADE ISSUE. Yeah either 1 or 3 would work for me, but that said, I'd like to see China phased out completely because we're funding lots of very bad things like the military base islands they're building in the south China Sea. Not only do they expect to claim all the off shore oil there, but also think they can lay claim to a very important shipping path that goes through there as well. Yeah either 1 or 3 would work for me, but that said, I'd like to see China phased out completely because we're funding lots of very bad things like the military base islands they're building in the south China Sea. Not only do they expect to claim all the oil in the sea there, but also think they can lay claim to a very important shipping path through there. seems Americans would rather have China become an economic and military superpower than pay a few pennies more for a pair of pants. Has any one not bought some Chinese product because it is now to expensive? Unfortunately for Xi, his people have had their first taste of prosperity, anyone who cancels that is subject to a coup. OldManOnFire and Idahojunebug77 like this. Yes. We switched from Japan to China and frankly, Japan has never recovered. Our First World Consumers are in far tighter supply than low tech third world manufacturing. China is challenging us on the High Seas, in space in the midst of massive arms build-up, putting monitoring stations in South America and doing it all with American Dollars. Of course it's time to shift our business to other third world suppliers. Vietnam, Cambodia, Thailand, Laos, India, Indonesia, Bangladesh, Egypt, Nigeria, Philippines, Algeria, and Sudan and many many others would be more than happy for our business and they won't turn our cash into Aircraft Carriers and advanced rocketry. Trump used a 4 by 4 to answer doubters of his America First economic policy. 4 by 4 as in 4 percent growth and 4 percent unemployment. Meanwhile the stock market has soared since we, the people, in the vast majority of states elected him president. Stock markets reflect investor optimism. Which leads us to 2018, a year in which the American stock market has grown another 6% while the rest of the world's stocks have declined in value by 5.8 percent. Pundits told us America would lose a trade war. Most people saw the U.S. trade deficit and assumed we had the poor hand. They assumed we were desperate for a deal. But President Trump saw the $800 billion-a-year deficit as a bargaining tool. You see, when your economy is the No. 1 source for the world's trade surpluses, other nations must do your bidding to keep you as a customer. "With stress breaking out from Turkey to Russia, equities in China bouncing around to the tune of $100 billion a day and talk of contagion everywhere, U.S. shares are turning into the safest bet. The S&P 500 is up 6 percent in 2018 and the rest of the world is down 5.8 percent, the biggest split in four years. Some of this nearly 12-point swing is President Trump's tax policy. Dropping the corporate tax rate and giving a good discount to money made overseas repatriated in the USA gave spurred this investment. But the experts said he would lose a trade war. They also said he would lose the election. Yeah he's doing great but the question is, will he be able to finish given all the obstruction the corrupt liberals and their idiot brainwashed minions are trying to do to stop him?. One thing's certain, two things will be revealed soon after the mid terms. If the blue wave does overtake the election it will show once and for all just how many truly stupid uneducated people with zero common sense live in the U.S. And secondly, it will reveal just how right conservatives were when everyone sees the country tank and go down the same path as Venezuela. But by then it will be too late. So basically there will never be a more important election than the 2018 midterms. If the democrats win back the house, not only will everything Trump did such as the tax cuts, be reversed, the democrats will continue to leave the border wide open taking in millions just to harvest their votes so they never lose another election going forward. And those coming won't be educated and contribute but will have to be supported all on the backs of the American taxpayers. The dems will keep giving freebies away which will send the country evem further into debt while loading up on regulations which will slow the economy to a crawl because businesses to compete on a global scale will have to close and go overseas to hire cheap labor. Then look for them to pass legislation to take away the second amendment so they can outlaw guns which they'll say is for our own good when in fact it will be so the masses can't ever fight back against the government gone rogue. This while allowing MS13 to stream across the border preying on U.S. citizens. The hatred against white people will keep escalating as well so let your mind wonder about what that will entail. Conservative speech will be completely silenced even more than it is now in schools and on college campuses. So, if you're hellbent on voting democrat, I suggest you forgo ever having kids. Yeah he's doing great but the question is, will he be able to finish given all the obstruction the corrupt liberals and their idiot brainwashed minions are trying to do to stop him? I'm amazed at what he has accomplished already. They can't reverse without Trump's signature. We didn't get much done when we held Congress while Obama was President, it would be the same for Dems. China is essentially an empire, one of the few remaining that has not exploded. A small group rules a large group and lives in fear of uprising and slaughter. The leaders in China are riding the tiger. They stay alive by keeping the people fed and content. That is the advantage of our system where WE rule, there is never anything to overthrow. In any system where you use force to remain in power, at some point either yours or your heirs blood will likely run into the street. Chinese leader Xi Jinping has reacted to American pressure with desperation. Xi slow-walked steps to reduce China’s reliance on runaway credit, debt and an antiquated state sector. He prioritized short-term growth over long-term upgrades. And then Donald Trump came along to imperil both objectives. Initially, Xi figured the president was bluffing. Beijing’s calculation was that, sure, Trump might slap some tariffs on Chinese goods, but it’s a mere negotiating tactic – his “Art of the Deal” writ large. After all, past American presidents had often attacked China on the campaign trail—only to make nice while in office. Xi’s men held it together as Trump slapped taxes of 25 percent on steel and 10 percent on aluminum. They figured Trump’s initial attack on $50 billion of Chinese imports in June would satisfy. Ooops! If the extra $200 billion of levies Trump tossed Beijing’s way in September weren’t reality-check enough, Mike Pence’s Oct. 4 “we-will-not-stand-down” speech suggests 2019 could get even worse for Beijing. Taxing Beijing is shaping up to be a 2020 re-election strategy. Forget Russia, Pence suggested: China is the real election meddler. 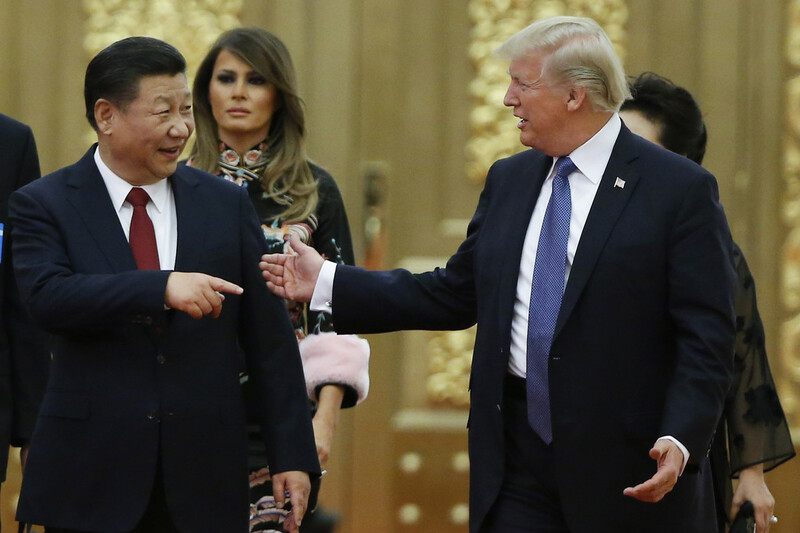 It “clearly laid down an official marker for a much more competitive and contentious New Era of U.S.-China relations." All this is throwing Xi’s domestic strategies into disarray. I knew there was a nut behind this thread! And I'm a dog. ibobbrob and AKS like this. You realize that China is the largest economy in the world outside of the US. And do you honestly think that American companies will stand by and have Trump keep them out of the largest economy in the world ? Or those American companies who import the cheap Chinese goods and resell them in america ? Sincere question...what happens to low cost retailers (like Walmart) without Chinese product. Personally, I have no desire to put money in the Walton's pockets, but I recognize the importance of Walmart for a large part of the population. There have been multiple articles to the effect that it will take 2-3 years to set up new supply chains for supply form other cheap labor Asian countries. Lighthizer is not really about producers fairly competing with products maftred without artificial pricing from currency manipulation. He is about predatory pricing of stuff like steel and solar panels and stealing IP. And the latter may be a problem for US mftrs attempting to use Chinese labor for a host of tech products. But the US will not win unless the EU is an ally in this. 2. There are fringe dems, but the dem party is not even close to implementing socialism and you know it. Turn off fox news. 3. You realize we have a net negative immigration rate at our southern border right ? 4. Take away the 2nd amendment. Jebus on a stick man. NOBODY is even proposing that ! MS13 preying on american citizens....good lord. Seriously, turn off Fox News. Seriously turn off CNN and MSLSD. Talk about delusional. At least everything I said is clear and happening before everyone's eyes IF IF IF they choose to accept it and not block it out because they've been completely brainwashed.